"I was kissing Valentine by a crystal blue Italian stream..." is how the Bangles put it. 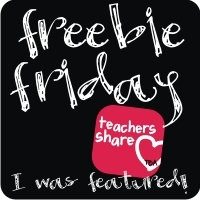 We may wish it was Sunday but good news-Monday brings freebies from Classroom Freebies and from Friday Freebies at Teaching Blog Addict! Yay! Today I am linking up my Editing Practice freebie. I made it for my second graders but I bet first and third grade teachers could get use out of it too. Click HERE to pick up the freebie! Love your Editing Practice freebie. Looks great! Now I'm going to have that song stuck in my head all night! But that's a good thing; a fun trip down memory lane on a cold and snowy night. Smile. Thanks for the fun freebie! Looks terrific! Thanks so much! Thanks for stopping by Jan ! Got that song in my head now! LOVE it! I also love to do editing practice with my kiddos, albeit they are older, but this type of exercise is still great! Thank you Angela! I can't believe I'm still seeing my second graders not having capitals at the beginning of sentences. Practice practice ! Thanks so much for sharing your freebie. My grandson is in 3rd and needs this!